Christmas comes but once a year, even though all the trimmings grace the shops for the 4 months before the big day. That used to perplex me and I ignored it until about December 15. That was until I had kids and discovered again, just how much fun Christmas is. One of the best bits is the Christmas craft and cooking. associated with the holiday. I find it very relaxing and satisfying to create pretty stuff. As you already know, I am into totally 'simple', as long as it comes with wow factor. The Christmas craft supplies from Spotlight tick both those boxes. They are really creative and so easy to use. Now I receive alot of invitations to attend the launch of product ranges, but when Kids Business sent the invite to the Spotlight Christmas Craft launch, I think I was probably the first respondent in the affirmative. At the event, there were 6 or so craft stations set up for us to test out the Spotlight Christmas craft range and it was one of the most enjoyable events I have attended to date, as a blogger. I used their fabulous bling bling stickers to create 3 ornaments, in about 15 minutes flat. These baubles come as papier mache, so you paint them first and just stick some pearls and diamonds on them and hey presto you have some beautiful decorations for the tree. I thought these simple ornaments would be great as teachers' gifts, or Christmas craft for a play group or kindergarten. The stickers come off in strips, so you can just cut them to size and create a beautiful ornament in minutes. My little girl loved the Spotlight craft supplies that I brought home too. In this You Tube video, she shows you just how easy and effective they are to use. She's just a tad cute, if I do say so myself. The Christmas card station at the Spotlight event was fabulous. With the lovely stickers and trim, it was easy to create really professional looking Christmas cards. Again my daughter shows you how easy it is to make them, in the video. Look at all those fabulous supplies. This kind of thing is soooooooo me. Then there was the cookie decorating station. 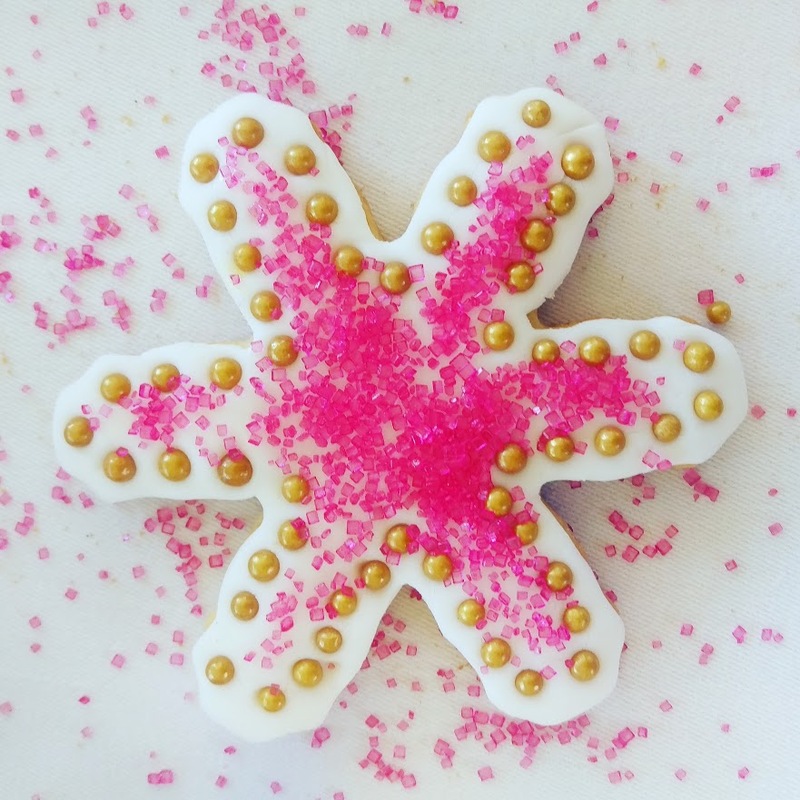 There's nothing like a bit of bling bling on a cookie for Christmas. The fondant is so easy to use and I think the results were really spectacular, for a novice like me. Perhaps I enjoyed the day so much, because I won the Heidi Swapp Minc. This is a fascinating machine that allows you to make fabulous cards, wall art and other craft. It is the newest crafting craze to come out of America, so watch this space. I am looking for a winner today too. To help you on your way with your Christmas crafting this year, Spotlight has given me a $100 gift voucher to give away to one Desire Empire reader. 1. Head over to the Spotlight facebook page and like it. 2. Head back here and comment down below, telling me you have liked the Spotlight Facebook page and also let me know,what Christmas Craft you love to make. Further entries to win this gift voucher, can be made by liking any, or all or my social media pages here. Also sharing this giveaway to your social media and writing a separate comment to that effect will constitute a further entry. This competition is closed and has been won by Sapna. Please contact me within 7 days to claim your prize. The winner will be announced on this blog, Desire Empire Face Book and Desire Empire Twitter accounts and I will contact you, as long as you have left a valid means. The winner will have 7 days to respond, otherwise the prize will be reassigned. Christmas craft, having already liked the Spotlight Fcebook page. There is only one prize (a $100 Spotlight gift Voucher redeemable only in Australian Spotlight stores) and only one person will win it. You do not need to have a Blogger account to enter this giveaway. Just sign in as anonymous and leave an email address. If you would like Desire Empire posts to come straight to your inbox every 10 days or so, you can sign up here for my Newsletter. Definitely liked the Spotlight page Carolyn and I believe the KS classroom would love some of the spotlight products to make gifts for their families- we love craft in KS!!!! we always have loads of fun making our own BonBons. Spotlight have a great range to embellish. Oh I just love to create at Christmas! DIY can be easy to follow, if you have the tools to borrow, so this year we are making our own sleigh for decoration! Getting crafty with Wood and paint, we can't wait. I got into making Christmas pom poms a few years ago, and then bunting. This year I would love to make some felt doves I saw on Facebook. I think they would make really great gifts. I have liked the Spotlight Facebook page. I have shared the giveaway on twitter. I love baking Christmas goodies from decorations(stained glass window cookies) to gifts( ginger bread people and Christmas cakes), then there's the rum balls and white Christmas. Christmas is the best time of year for showing off the love I put into my baking and creating. I've liked the Spotlight Facebook page for ages! I like to make CHRISTMAS WREATHS for younger members of the family as they shift out into new homes of their own! shared the giveaway on instagram and tagged you as well. Already liker of Spotlight FB page. I love all Christmas crafts, but Bonbons would be the most fun because you can personalise the gift inside as well as the jokes. - Di. Spotlight facebook fan already. Have to say stringing popcorn to hang all over our fresh Christmas tree. It's one of those mindless crafty tasks that you can do while watching the telly, and of course you can eat as you go. Have shared on FB :) :) - Di. Oh Spotlight, such a dangerous place to visit! How fun do all of those crafty/cookery things look? I love decorating candles and baubles for christmas. This year the kids and myself are tackling christmas cards. Should be interesting and alot of fun!! Me and my girls love making personalised bon bon at christmas time, with a funny joke & a special suprise inside. Liked/shared on Facebook, Pinterest & Instagram. I've seen a large green felt Christmas tree with decorations children can put on and move around on one of the Mummy blogs. I'm gonna tackle a similar thing but make fancier decorations with velcro attached to put in the school library that I "manage". I'm not great at craft or sewing so this is a big project for a novice like me. I love Spotlight I spend hours browsing the crafty shelves looking at everything! I like to make Christmas cards, I just started making some recently but need some more embellishments and pretties to make any more. Have liked the Facebook page. I would love to make my own personalised Christmas decorations for our Christmas tree! F/B page liked. Love to make my own Christmas Crackers, Gingerbread house and Christmas wreaths with a mix of flowers from my garden and handmade decorations. Love the idea of creating personalized Christmas baubles, now we have three young granddaughters, those sorts of crafts hold extra meaning. Have liked Spotlight on Facebook. As Spotlight seems to be my second home I've already liked. We like to make Christmas cards too usually a very messy process but fun for the recipient. Spotlight is a great place for present shopping too. I'm in love with your daughters Christmas decorations! What a wonderful idea, and how lovely to make your tree even more personal. I bet my daughter would love to make them and give them as gifts to her teachers this year! Oh my... I stop off at Spotlight on my way home from work at least once a week... this gift voucher is sorely needed!